Figure 5. Crankshaft Woodruff Key and Plugs. Figure 4. Crankshaft Journal Specifications. Install the lower main bearing caps (Figure 6, Item 5) in their original locations. Remove woodruff keys (Figure 5, Item 1) from crankshaft (Figure 5, Item 3). Install new woodruff keys (Figure 5, Item 1) into crankshaft (Figure 5, Item 3). 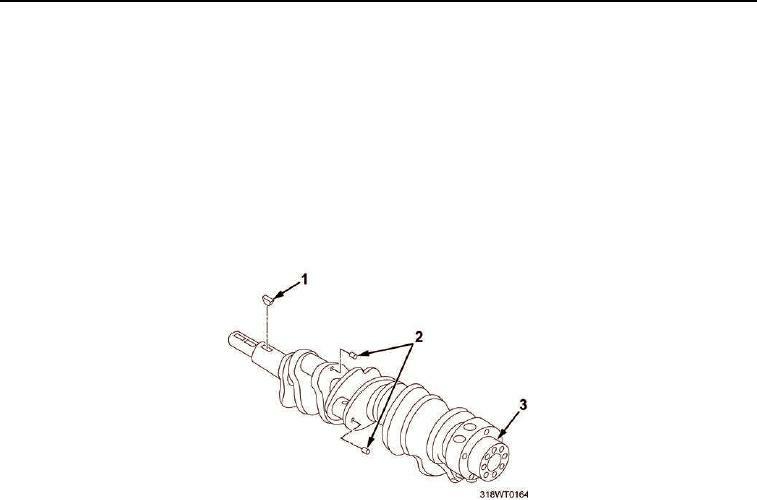 Remove plugs (Figure 5, Item 2) from the crankshaft (Figure 5, Item 3). Install new plugs (Figure 5, Item 2) into the crankshaft (Figure 5, Item 3). Slide oil pump drive gear (Figure 6, Item 12) onto crankshaft (Figure 6, Item 7). slot or groove for the oil distribution. The lower bearing (main cap side) is plain with no slot. Failure to comply may result in serious damage to engine. Install the main bearings and caps. the bearings aligned with the slots in the engine block. Apply a light coat of engine oil to the crankshaft upper bearing surfaces (Figure 6, Item 8). bearings (Figure 6, Item 8). The grooved side of the thrust washers must face toward the crankshaft surface.